What’s Up With Breadboard Ends? A breadboard end is a piece of wood that’s joined to the end of a larger panel. Breadboard ends are the strips that are often found on the ends of some Amish tables. They run perpendicular to the larger panel and contribute to defining the form of the table panel. The breadboard runs cross-grain to the panel it is added to. Close up of a breadboard end on the Barstow Trestle Table. Breadboard ends serve two purposes. 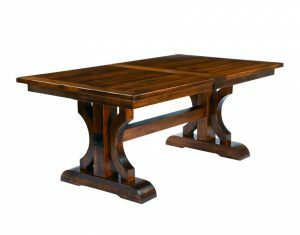 They are a decorative feature, adding an interesting element to the table’s design and they are functional, helping to aid in maintaining the structure and stability of the large center table panels as they naturally expand and contract. 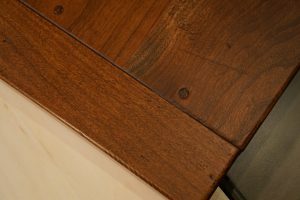 A tongue and groove method is often used to fit the edges of a breadboard end with the table panel. One method involves a tenon that’s made along the length of the panel. The tenon is then fit into a groove that goes along the length of the breadboard. They are securely joined with wood dowels. This method of joinery makes for a strong connection and is not easy to make. Breadboard ends attached this way represent fine woodworking and an understanding of the complexities of the wood. The breadboard end is securely joined to the panels it helps protect. 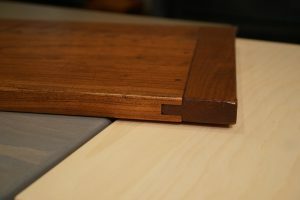 The circle represents the strong wood connection that runs through the panel and connects it to the breadboard end. 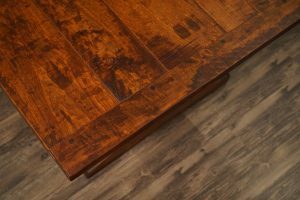 Breadboard ends are popular on large, rustic farmhouse style tables and reclaimed wood tables. 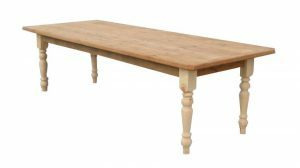 The Amish Barn Wood Farmhouse Table with Breadboard Ends. 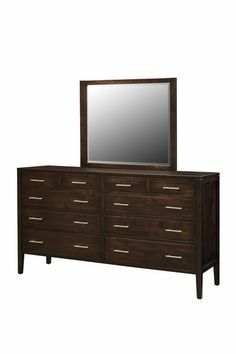 As the seasons change, authentic solid wood will move across the grain, expanding in warm weather and shrinking in cold weather. The breadboard end allows this movement to occur and acts as a stabilizer and guide of sorts. 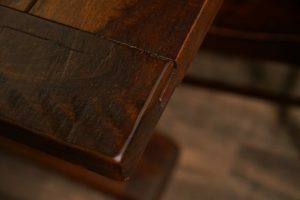 When the wood panel of a table moves naturally, the connection to the breadboard end helps prevent it from expanding to the point of cracking or shrinking to the point of cupping. 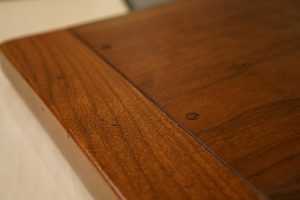 Close up of a breadboard end attached to the center panels of a dining table. A breadboard end will either fall short (by that we mean it will look shrunk in) of the panel edge or will extend past (swell out) it depending on the season. It may not be perfectly flush all the time. Remember that if the breadboard end “moves” with expansion or contraction of the wood, it will move back as the center paneling moves again. The tab in this breadboard end extends out past the edge of the table slightly, indicating the natural expansion of the table panels in warmer weather. It will shrink back during the cooler months when the panels contract. A breadboard end is a functional decoration that gives a pretty look while it does an important job. The appearance of movement with the breadboard end is not a defect. It’s actually a sign that your table is made well and that the wood is moving as natural wood does and the breadboard end is helping to stabilize it. **Important note: The position of the breadboard end is an indication of what your table is doing. 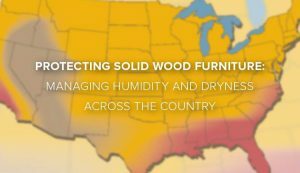 It is normal for the wood to move, but it is also a reminder to keep a check on the humidity in your home that must be managed to protect your solid wood furniture. 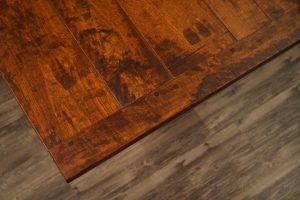 We offer top tips for managing humidity and dryness in this previous Timber to Table post, Protecting Solid Wood Furniture: Managing Humidity and Dryness Across the Country. The gorgeous wood grain of the breadboard end runs perpendicular to the table panel grain. 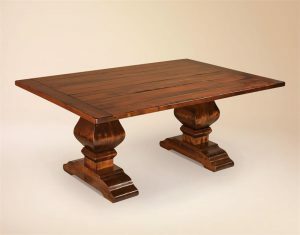 A breadboard end on the Vienna Plank Top Trestle Dining Table currently featured at the DutchCrafters Sarasota, Florida showroom. 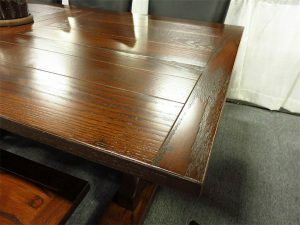 The Marriot Amish Plank Dining Table with Breadboard Ends. 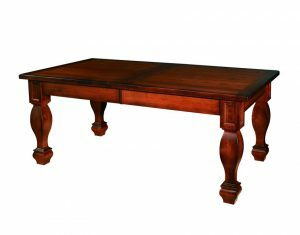 Breadboard ends are one of the many features of Amish furniture that always comes with top quality construction.